February 2017 – Simply Organised. Simply Beautiful. 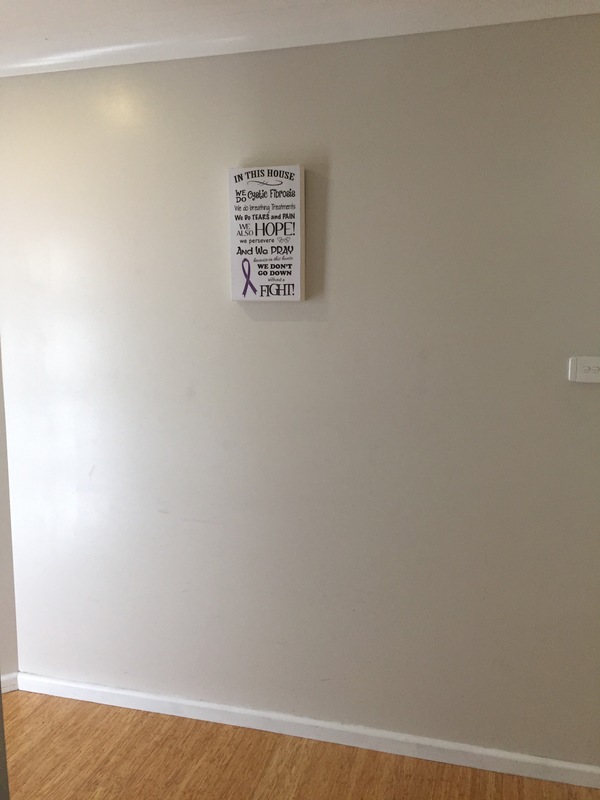 One of my first posts was sharing with you our Entryway. I’ve been a bit bored with it for a while and have been wanting to give it a bit of a facelift. After completing Kyly’s entry a couple of weeks ago, it inspired me to finally do something about it. Step 1: For about a week before it I placed all items i was considering using and placed them on the buffet. This meant every time I walked in the front door or walked passed it I was forced to consider how I wanted the spaced to look. Step 2: Removed all the items from the buffet and wall and placed them on the dining table. Step 3: Clean the wall with sugar soap. I was amazed at how dirty the wall had become around the photo frames. Step 4: I played with the position of the shelf and the mirror and star to make sure that the mirror would still be usable above the shelf. Step 5: I used a stud finder to locate the studs. I marked the studs on a post-it note so that I wasn’t marking the wall. Step 6: I was alone at the time and didn’t have anyone to help me hold the shelf in place. We happened to have moved from ADSL 2 to NBN that same week so I used the Fetch box, modem box and a photo frame to hold the shelf in place. I screwed the shelf into the wall – into studs. All level but the drill did leave a mark when I screwed in the second screw. A bit of white paint and it will be all good. Step 7: I then used 3M products to attach the mirror and the star frame to the wall. The mirror measures 60cm tall and the star frame 55cm so I ensured I centred the star frame to the mirror. Step 8: Now for the fun bit – pulling the look together. I knew I wanted the black and white photos there still as they are snaps we took on our honeymoon nearly 10 years ago. I then placed items around them. And this is the almost finished product! I am going to paint the front of the “OXO”s navy and my hubby has suggested that I run a piece of blue ribbon along the front of the shelf to supply more contrast. I’m giving this some thought and will give it a try. So, have Kyly and I inspired you to do up your entryway? Would love to see pics of your before and afters. You can either share them in the comment section on Facebook or tag me on Instagram. Close your eyes it ain’t pretty! Oh friends… I cleaned out my shameful cupboard recently. It was bad, really bad. I forgot to take a before photo but here is a photo of the cupboard empty and here is a photo of all the stuff on our dining room table and kitchen bench. Knowing that this cupboard was in a bad state was causing me stress over Christmas, New Year’s and whilst we were away in Mollymook. I wanted to tackle it between Christmas and New Year’s but got sick and didn’t have the energy. One Saturday night I emptied the cupboard out so that I would have to deal with it on the Sunday. I don’t mind one or two meals away from the table, but I wouldn’t have liked too many more than that so doing this would force me to deal with it. As with all of us, the end of the year gets hectic. Christmas presents were purchased and placed in here for wrapping. School items were placed in here waiting to be sorted/discarded/filing. Linen was used/washed and chucked in here, not put away properly. The list goes on and on. Funny story. Whilst we were away my brother and his family were over for a BBQ and a swim. They needed a plastic bag, knew that I stored them in this cupboard, went to grab one and were in shock when they saw the state of the cupboard. Yep, it was bad! Lol! So, step one: Place like with like. I gathered all the appliances I was storing in this cupboard and placed them together. All our esky’s and food storage together. All linen together. All art supplies together. All party items together etc. Step two: Now that you have like with like you can see how many items you have within the one category. We had too many esky bags and picnic sets. They’ve seen us from when we were just two and to now that there is four. We decided to get rid of the two person sets, cooler bags that were too small etc. I did this for each category that I store in here. Step three: Think about what you want the space to do for you. As I’ve mentioned before, we don’t have a garage or linen closet so all our miscellaneous items get stored in this cupboard. I want to be able to open this cupboard and find exactly what I want, when I need it easily and be able to return the item easily. Step four: Start putting everything back. On the floor – I store our table linens, spare cushions for extra seating when we are entertaining a crowd, green bags for the supermarket, some plastic bags and my tools and DIY project items. Shelf 1: – Party items, Gemma (dog) food/items, spare photo frames, sewing kit and sewing machine. Shelf 2: Art/craft items and baking supplies, miscellaneous items. Shelf 3: Wine, water, napkins and surplus toilet paper and paper towel (we buy these two items in bulk from Costco). Shelf 4: Board games and picnic items. Shelf 5: An “office in a box” for each kid with an “in”tray for each kid for me to place items for sorting/culling/filing. On the sides of the cupboard we store our spare shopping bags, herbs/spices, art supplies, gift bags and large lanterns which will go outside when we do up our pool area. Look, it’s not perfect but it is decluttered. It is organised. I have maintained it easily over the past month. Everything is easily accessible. Since commencing the KonMari method we have let so many items go and as a result of this, these containers are currently not required in our home. So, do you have a disaster cupboard that needs looking at? Does it cause you stress? Tell me – maybe I can give you some tips! So I am a little bit excited! My wonderful friend has asked me (ME!!!) to help her bring her home to life and to have her home reflect her and her girls. Like most of us, money is tight, especially at this time of year post Christmas and the purchasing of all the Back to School supplies. This makeover will be over an extended period of time but step one has already made a big difference. To create a space that feels welcoming, homely, fun, happy and like me. Kyly purchased a new lounge and some cushions for it 6 or so months ago. The cushions were $20 each from﻿ Big W and the pinks and oranges are the primary source of inspiration for this makeover. Kyly has been a lover of pink since I’ve known her in 1995, and well before then. As you walk into Kyly’s home there is very short hallway that brings you to her living room. The wall is just over 2 metres long. 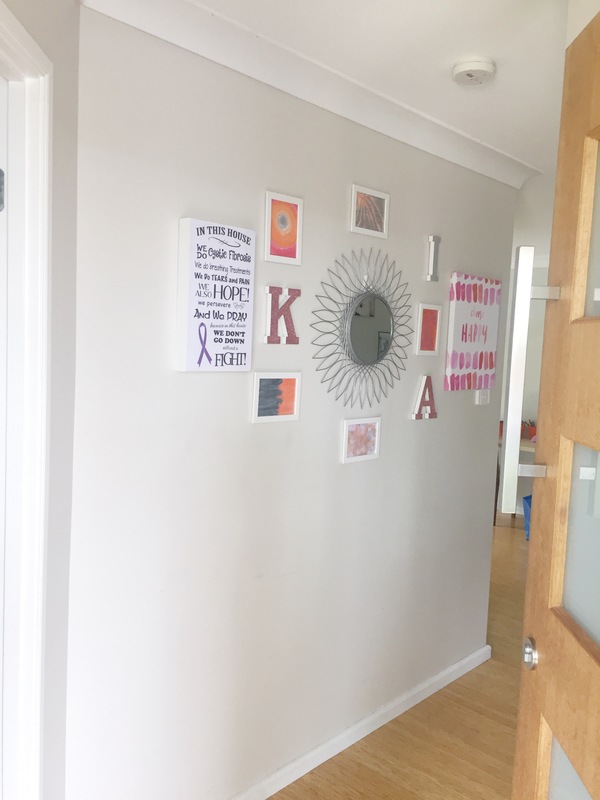 There is a beautiful artwork there signifying that this is a home that has a child living with Cystic Fibrosis here which prompts you to clean your hands upon arrival. Kyly wanted to create more of a welcome along this wall and I was only too happy to help. We started by sourcing a few bits and pieces to go on this wall. I located the mirror at Trade Secret for $20.00 and the art print from Big W for $12.00. 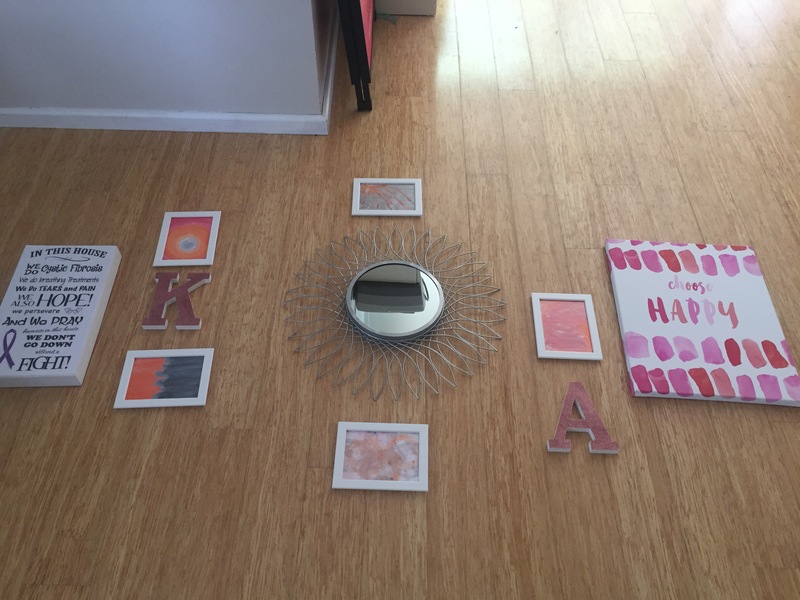 We went to Typo to purchase the letters K, I and A (3 letters for $10.00) and I stopped in at IKEA on my way up to Kyly’s place to purchase 5 FISKBO frames ($1.49 each). 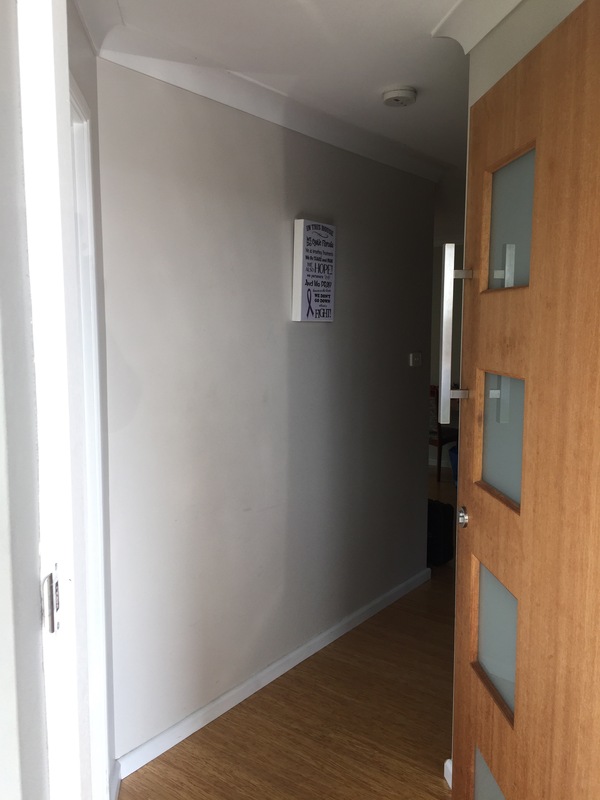 Once I arrived and we had a little chat, we collated all the items and discussed how we would lay the items out and ultimately hand them on the wall. We headed to bed, ready to put it all together on Sunday. Sunday came and after a lovely beach-side breakfast and trip to Typo for the letters, we commenced hanging things on the wall. Her two girls squealed with delight and loved their letters so I guess it was a win with them too! 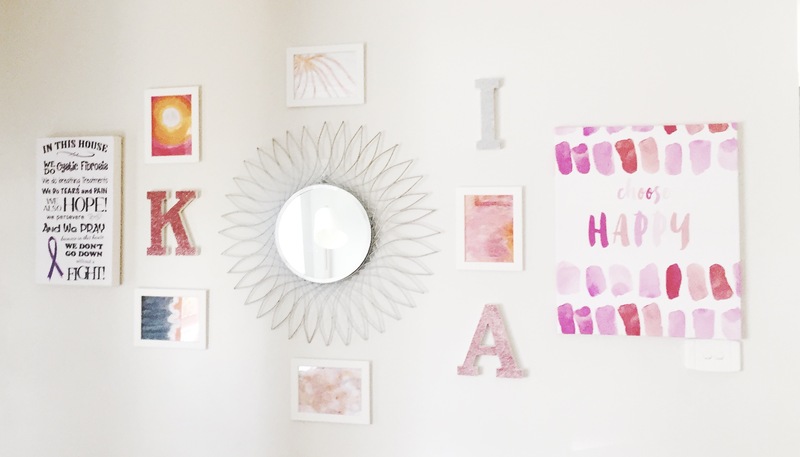 The total cost of this makeover is $46.90 ($12.00 Big W print, $20.00 mirror, $7.45 Ikea frames, $10.00 typo letters). So tell me… have you been inspired by my entryway or this one? 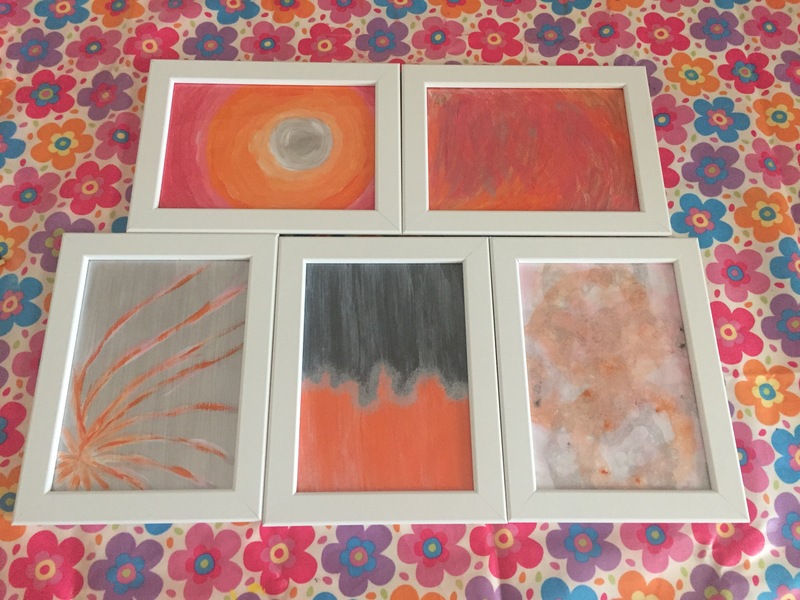 Do you like to do a bit of DIY art? People also complained about not having enough downtime, yet spend 70% of that downtime on devices/screens and not utilising this outdoor space. Wow! It got me thinking about my personal situation and what I observe of my friends and family. I don’t think we have an excessive amount of storage at home. No garage. No linen closet. We do have a double door pantry which I use for a mixture of items. We have a shed for all our tools and garden items ect. We have installed an attic ladder and store our Christmas decorations and camping gear up there. Out of my friends and family that I know to have garages, only 20% of them park their cars in them. The balance use it as an extra storage area. Clutter and mess certainly stresses me out more than my Hubby. Over the Christmas period, the double door pantry got out of control. Stuff everywhere. Stuff that didn’t belong there had been chucked in there because I didn’t have the time to deal with it properly. I knew it was something I had to tackle but didn’t have the energy to do until after we got back from our vacation in Mollymook. It was weighing on my mind as a ‘to-do’ item. When I checked in with my Hubby about this he said that the cupboard didn’t stress him out, but it bothered him that it was bothering me. A couple of weeks back we were going to be home most of the Saturday so I spent Friday night emptying it, forcing me to deal with it on the Saturday. I did it. I got rid of a box of items for charity, a bag of rubbish and put everything away back in it’s place. I immediately felt better with a decluttered space and a decluttered mind. I don’t know that this comes down to gender, I think it comes from a sense of control and order, a need to know where things are and that jobs are done. I know men who feel this way. We have a Costco membership. People are often unsure if it is cost effective or not. The savings we make on fuel alone plus savings we get on my contact lenses sees us well ahead of the cost of the membership, let alone what we save on other household items. We mainly only buy toilet paper, paper towel, tissues and some laundry/cleaning products. Occasionally we buy food items. I am able to store these items either in the laundry, under the sink or in a single basket in the pantry. We only have the space for one fridge/freezer in our kitchen. If we had the space? The only time I would like a second fridge/freezer is when we are entertaining a big group but for the couple of times a year we do this, I don’t see the value. I’ll just keep shuffling things around. We have gone through various stages in our home. When we first moved in 12 years ago, all we had was the stuff from our bedrooms at home. I felt the need to fill our four bedroom home. And so I did. Two spare bedrooms were set up. A home office was created and we said yes to most items we were offered, filling our cupboards to the brim. Then Miss 5 came along and we took a room back to set up the nursery. Then we took half of the fourth bedroom back to create her playroom. Then we took another room back to create Miss 5’s big girl room so Mr 3 could go into the nursery. Then we took the other half of the fourth bedroom back to create my studio and now we are as we are. I can’t even tell you how much has gone in the bin/to the tip/to charity over the years. But if feels good! Outdoor vs Indoor time. Like the article says we have spent a lot of money outside. Whilst our pool was already here, we’ve spent lots installing retaining walls, excavation, fencing, plants, furniture, swing set and a cubby house. The kids are starting to spend more time outside. Daylight savings plays a part in this for us as we are at work through the day. They’ll play before dinner after we get home from work, after school the days I’m home and flit between different activities inside and outside on the weekend. This also depends on whether the TV is on or not. As to how much time my Hubby and I are outside with them, not so much. Realisitically we are on our devices too much but we are also busy studying/cooking/cleaning/washing or taking a moment to watch our TV programs. A couple of years back, I fell in love with this beauty. (Images from Barrington Homes). 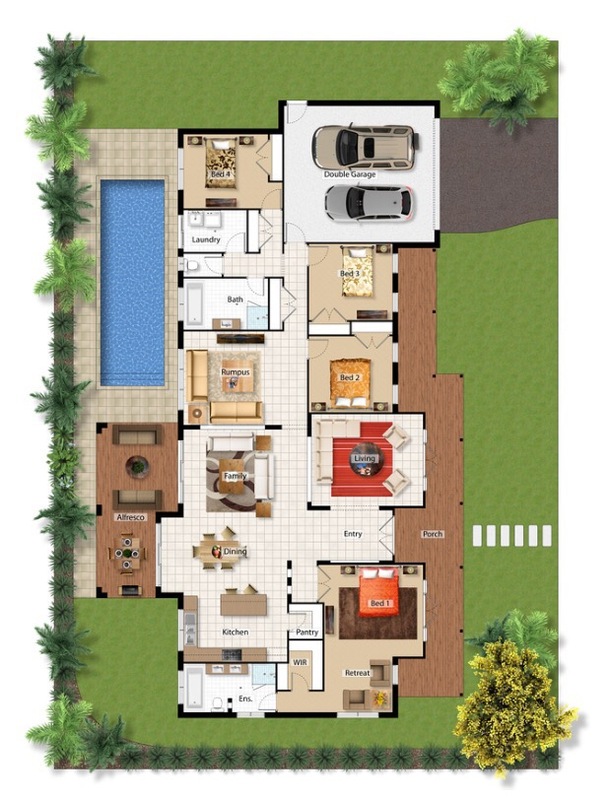 Take a look at the floor plan. Gorgeous, isn’t she. 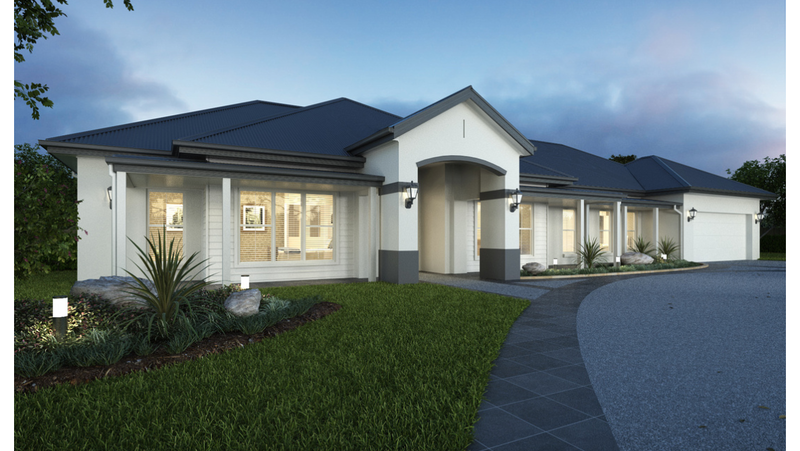 The house just screams ‘me’ (I felt so at home here, and have visited the display home many times. Family have visited it and agreed and I have taken two girlfriends here who also agree) and I thought it would be the perfect home to entertain in, grow in and give us each some space. We became priced out of the opportunity to build this dream home in an area not too far from our family and I think I am a little bit glad (only a little bit – it still stings a bit to know we can’t build the dream yet). I hate cleaning bathrooms, and I would have had an extra one to do. We would have had more space for the kids playroom, but would that be at the cost to lost family time? Hubby and I still have the dream at building a place from scratch, and it might happen one day, but for now we are sitting tight. This post has rambled on a bit. For me, the article ignited my passion to help people declutter, to live comfortably within their home, to feel less stressed, to enjoy it and to love it and for it to bring you joy! How does your home make you feel? Does the clutter stress you out? What methods do you employ to tackle the clutter? KonMari? Ignore the mess? Please, let me know!! !